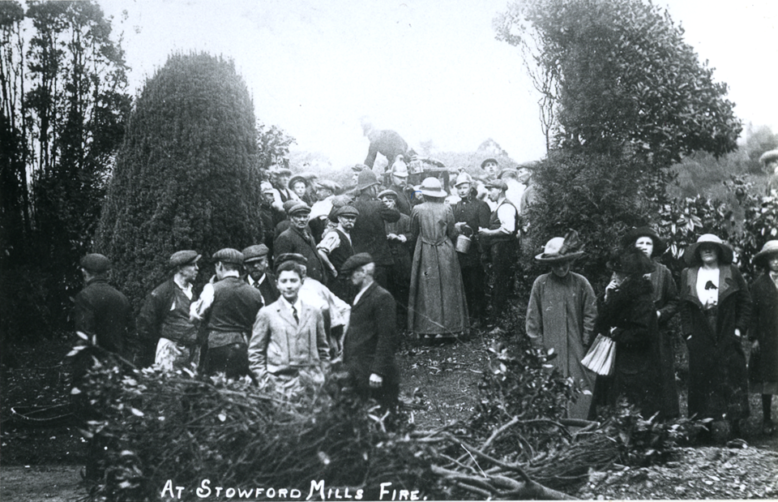 A major incident occurred at Stowford Paper Mill on 5 May 1914. A fire which started in the rag loft, located on the upper floors of the main building, soon took hold of the entire structure. Many local people along with mill workers gathered outside to watch the spectacle as smoke billowed high into the air. The fire proved to be devastating, curtailing paper production until the building was repaired. The whole event was recorded in substantial detail in the local news paper the following day. A fire broke out early yesterday morning in the paper mills of John Allen and Sons (Limited) at Ivybridge. The mill buildings, with Stowford Lodge and gardens, formerly the residence of the proprietors, are a well-known feature of the beautiful valley of the Erme at the entrance to Ivybridge from the railway station. 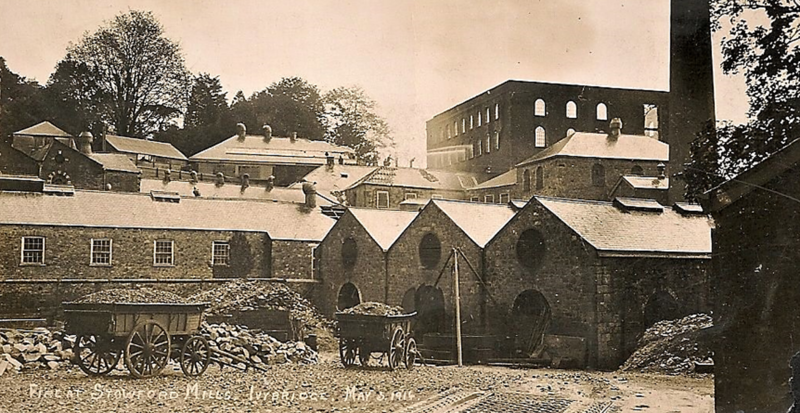 The mills have stood there for some generations and have been a main factor in the employment of the people of Ivybridge. In 1910, the firm was taken over by the Clapperton Syndicate and made into a limited company, with Mr. George Clapperton as managing director and Mr. James Carter Allen as secretary; and the mills have since experienced a fairly good run of trade. So much so that the company have been encouraged to add a new engine house and chimney stack to the already large group of buildings. It is in red brick bearing the date 1914 and it is not yet completed. Towering above the engine house was the great main building of the works. It was a five storey building with a basement under the western end of it where the ground slopes towards the river. Along its south front run the words “Stowford Paper Mills, 1862”. It was in this building that the fire occurred and the building was completely gutted. Only the brick walls stand and these are seriously cracked and bulging at the top. On the east side the building abuts on the Harford Road and this road had to be barricaded lest the wall should fall on passers-by. Stowford Lodge, which stands close to the mill, is now the Devon School of Gardening for Ladies and the inmates of the house, although it was in no danger, were naturally very much excited by the fire and the invasion of their grounds by fire engines. The origin of the fire cannot be very clearly ascertained. In the basement of the large building there was a turbine with belting and ropes communicating with all the floors. It is supposed that by some means the belts and ropes of this shafting caught fire which quickly spread from floor to floor. The fire appears to have broken out about a quarter past six just after the men of the night ‘shift’ had left work. Other men had come in and were working on the floors devoted to beating and bleaching but fortunately there were no women at work on the top storey. The women were not due to come in until eight o’clock. Fred Moggridge, a lad working in no 1 room, found the place filling with smoke. He tried to get up the stairway but found the smoke too thick there. He consequently ran out of the door and informed the men working in other buildings. The men upstairs had no difficulty in getting out of the building although the stairway was filled with smoke and they had to feel their way down. The fire spread with great rapidity and soon flames were coming from the windows of nearly every storey and bade fair to extend to adjoining buildings, especially the foreman’s house. A small manual engine kept upon the premises was got to work with all possible speed. There was a plentiful supply of water from the great launder which carries the leat from a high level into the boiler house through the works for power and other purposes and then empties into the Erme through a tunnel. The Ivybridge fire engine arrived soon afterwards and was followed later on by Plympton Brigade and their manual engine and by the Stonehouse Brigade with their steam engine. The engines were all worked and the hoses laid along the leat which enters the building from the grounds of Stowford Lodge. The works engine came first and took up a position nearest the burning building. The Ivybridge, Plympton and the Stonehouse engines were all in the ground of Stowford Lodge. The Ivybridge engine superintendent, Mr. W. H. Full, a surveyor, and Captain W. Martin received the alarm about a quarter to seven and as most of the men were just going to work, they were at the mill in a few minutes. The Plympton Brigade, under Supt. W. H. Hockin, received the call about 7.10 am and twelve men and the engine were at the fire in about an hour. The Stonehouse Brigade were summoned about twenty minutes to eight. Mr. F. W. Thuell, captain of the brigade, accompanied by Mr. O. R. Matthews, deputy chairman of the District Council, and Mr Mitchell, chairman of the fire engine committee, motored out to prepare for the arrival of the brigade. Some members also motored out with 2,000 feet of hose and other gear. The rest of the brigade with the engine left Stonehouse about 8.05 and reached Ivybridge at 9 o’clock. For several hours, all the hoses were directed onto the burning debris at the bottom of the building. This consisted of bales of pressed rags and wood pulp, which continued for a long time to send up volumes of smoke. A number of cutting machines were also in the building. No estimate can yet be made of the damage which must run into thousands of pounds. The buildings and their contents were insured in several fire insurance offices. A squad from the George Street Church Ambulance Corps, Plymouth, was in attendance with the Stonehouse Fire Brigade. 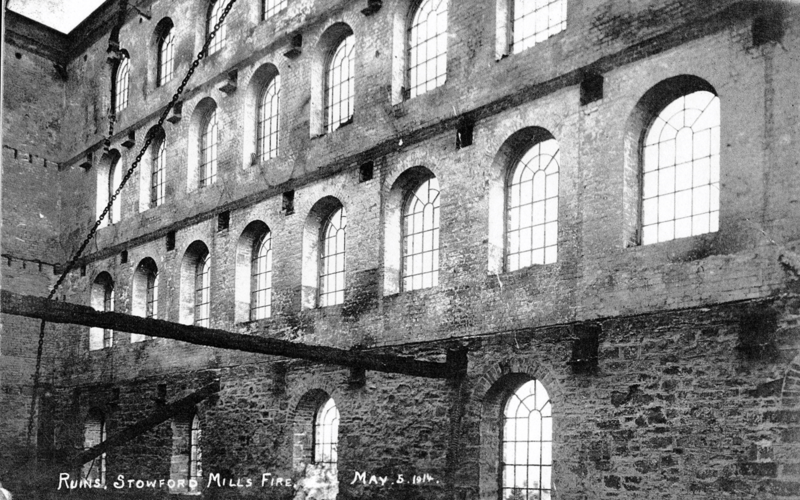 When the paper mill restarted after the fire, a new but fairly primitive sprinkler system had been installed to avoid fire damage from happening again. However, there was a problem, the headroom between the five floors of the rag loft building was very low and the sprinkler heads were constantly being knocked accidentally and the floors flooded. In desperation, holes were drilled in each of the wooden floors to allow the water to drain. By the following morning it was clear that major damage had been sustained to the mill. The rag loft was completely gutted. Other adjoining buildings were also damaged, as was the water turbine and the launder. It was feared that the incident would close the mill, as was often the case following fire around this time. However, Stowford Mill was one of the lucky ones and was successfully repaired. The total cost of restoration was approximately £14,000. During reconstruction the mill workforce experienced reduced-hour working. This was to become a regular occurrence during the First World War when orders were short. Orders remained scarce even after the war, making for a difficult period in the history of the paper mill. The Rag Loft was successfully rebuilt after the fire, but the bell chamber at the top of the building was not replaced. The bell which had been sounded to call employees to work was damaged beyond repair. Fortunately there was a bell in the small belfry at the Lower Mill and this was fixed to the side of the rag loft. The bell was later replaced by a hooter. Stowford Paper Mill during the nineteenth century. 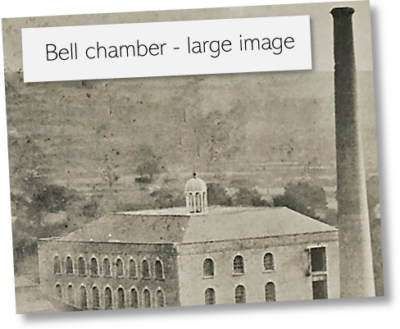 The main mill building still has the bell chamber which was not replaced following the major fire in 1914. The photographer of the large image was William Harding Warner (1825-1895). During the 1860s he was based at Ross-on-Wye in Herefordshire before moving to Bishopston, Bristol, during the very early 1870s. He specialised in publishing stereoscopic views (for the most part of Herefordshire, Devon and mid-Wales). This photograph is mounted on card serving as a carte de visite, perhaps taken during the late 1860s. On the 5th May 1914 a major fire started in the rag loft at Stowford Paper Mill. Workers and villagers gathered to watch as the smoke rose high into the air. A full report of the incident appeared in the Western Morning News the following day.